Had a note from our beast wrangler about “news” and how it would affect her drive over here the next time we went on a trip. She guessed she’d have to use 101. I checked online and found that 250 yds of the MacArthur maze interchange leading to the Bay Bridge collapsed this morning after a tanker truck loaded with 8600 gallons of unleaded gasoline on its way to a gas station in Oakland lost control and overturned at 3:40 a.m. The driver got out of the truck under his own steam and walked to a nearby gas station where he grabbed a taxi which took him to Kaiser Hospital, Oakland. Kaiser later transferred him to the burn unit at St. Francis Hospital, here in San Francisco, where he’s being treated for second degree burns. And that’s it! That’s the extent of injuries! Alas for the roadway, though, the truck didn’t do as well. After the driver got out, the truck exploded. The firemen got the fire out by 5:50 a.m. but by then the fireball had burned so hot (in excess of 2000 dF) for so long that the steel in the roadway softened and twisted, the bolts holding the concrete failed and the structure collapsed. We keep wondering what will happen if something happens to that bridge. 270-280K people a day use the Bay Bridge to get from here to there or vice versa. Well, here goes. A wakeup call. It could’ve been worse, a lot worse. Luckily, the bridge is intact. You can get across the bridge but once you get to the east end its roundabout detours to get where you want to go if you usually take the pieces of freeway that were damaged and getting onto the bridge to head west is also a problem. There are alternative routes that are usable. BART is adding more cars. ACTransit is advertising its bus service. Traffic will be hellacious. Update: Will Kempton, CalTrans, says that the two roadways that are damaged carry approximately 30K vehicles a day each. Even if your route isn’t compromised, you’ll be stuck in traffic caused by those whose routes are. What a mess. It will be months before the busted parts and the parts that may have been weakened can be rebuilt and usable. Click screen to clear. Use arrow keys to control. It is the mission of The Ocean Channel to provide ‘ocean people’ from around the world with a comprehensive and centralized source of ocean news, education, conservation, and entertainment. Deep resource. Conservation issues. Film. It is only through knowledge and education that we can expect our audience to recognize the challenges the sea faces now and in the future. WELLINGTON, New Zealand (AP) — Wreckage from a World War II torpedo boat was tossed up from the sea in the Solomon Islands after a powerful 8.1 earthquake hit the area in early April, an official said Friday. Jay Waura of the National Disaster Management Office said the explosive-laden boat was exposed when reefs were pushed up three meters (10 feet) above sea level by the April 2 quake, which caused a devastating tsunami in the western Solomon Islands that killed 52 people. The Solomons’ coastline is still littered with decaying military wrecks from World War II, including the torpedo patrol boat commanded by U.S. President John F. Kennedy. Do you have your earthquake kit ready? 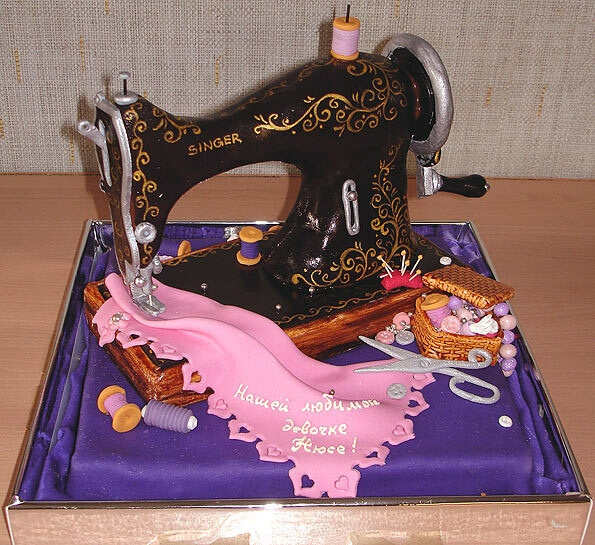 Amazing Cake Art (more than just the one cake pictured below) found at englishrussia.com — allegedly totally edible, allegedly made by Zhanna from St. Petersburg. Doll Face by Andy Huang ~4min. Doll Face follows a machine’s struggle to construct its own identity. This week the Globe and Mail published the obit for Margaret Dorothy Killam Atwood, who died last December, aged 97. What a wonderful homage to Margaret Atwood’s mother, written by the daughter. Someone said to me recently, ‘You must have had an unusual mother.’ True enough. The last time I heard multiple ‘copters circling overhead was when morning broke on 27 February, the day a piece of Telegraph Hill slid down onto buildings on Broadway. All the news crews were out with first light to get pictures of the pile o’ rock. … but what’s up this afternoon? Checked kpix.com which morphed into cbs5.com. Ah, yes. Silly, forgetful moi. It’s the last Friday of the month. Critical Mass starts at 6p. The bicyclists are starting to gather at Justin Herman Plaza, just >>> over there. Last month’s Critical Mass turned real ugly and most of blogville seemed to take sides in the aftermath. Here’s hoping tonight’s peaceful and hoping his nibs remembered and will be home before the mass moves. Film clip of the opening of the world’s largest bridge. 1937. I don’t have much influence in Sacramento so when the news came out the other day that AB 722 (introduced by Assemblyman Lloyd Levine, D-Van Nuys) had emerged from the Utilities and Commerce Committee and was on its way to the Appropriations Committee, I didn’t yack about it one way or the other. Earlier this week, though, Don yacked about it and when I went off to track down what the bill really says (rather than what blogville and media meisters tell me), I found that the bill is more sensible than it’s been given credit for and isn’t really quite so precious and idiotic as some folks have opined. (1) 2012 is five years away. People will have time to get used to it. (2) General Electric says they can produce incandescents that use far less electricity. Mandate energy use, GE says. Don’t ban incandescents. Q for GE: If you could do it, why haven’t you? (3) The bill doesn’t affect bulbs less than 25 watts or greater than 150 watts. (4) And just look at the exceptions! lamp, or vibration service or vibration resistant lamp. No worries about the light in your oven, folks. You people, and you know who you are, who um. use plant lights? No worries. Don’t know what kinds of lights some of those are? I tracked down a nice little publication on Appliance Efficiency Regulations from the California Energy Commission (the outfit that defined general service incandescent lamp) that explains (among other things) what all these different sorts of lamps are. The left-handed tread lamp? Well, turns out “Left-handed thread lamp” means a lamp on which the base screws into a lamp socket in a counter-clockwise direction, and screws out of a lamp socket in a clockwise direction. So when all’s said and done, I’m not griping about this legislation. Turn in those bulbs. Fluorescents work better these days and light up fast enough to be used with motion sensors. Certain new fluorescents can even be used with dimmer switches. There’s a new world coming.